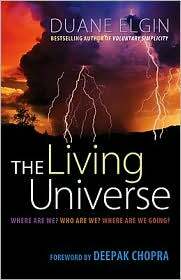 I want to start this review by saying that I do agree with the general idea of this book: that the Universe is alive--perhaps not in the way we automatically think of "life", but at least in an animistic sense. And Elgin does try to argue that the Universe--not just Earth--is a living system, even an organism. It's an intriguing idea that seems to naturally follow Lovelock's Gaia Hypotheis. The other issue is that his mix of disciplines doesn't quite work. Going from "physics proves that the Universe is sentient and alive" to "all these world religions see the Universe as sentient and alive" seems a bit jarring. Not that I don't think either point could be argued, but again, the multidisciplinary approach didn't really work for me. I like my hard sciences, and I like my human subjectivity, but it's somewhat like the book was written in multiple languages. Maybe it was just the way the author transitioned from one to the next, but I didn't really feel the approaches to the same hypothesis really worked together in this combination. Don't get me wrong--there are some good points to be made here. And I was still left with some food for thought. I agree with the general message: that we need to be much more considerate of the world and universe around us than we currently are. I also think the author included some good advice for changing one's perception thereof. Unfortunately, I think the book could have been much better-written for the reasons stated above, and that made getting the message a lot tougher.